May 30, 2010  A new study shows human growth hormone (HGH) has startling effects on speed, yet the major U.S. sports leagues still don't test for it. Host Guy Raz speaks with Gary Wadler, a professor of medicine at New York University and chairman of the World Anti-Doping Agency, about the study and what HGH can do to your body. May 30, 2010  On June 5, the town of Elmont, N.Y., will play host to the Belmont Stakes, and many eyes will be fixed on 25-year-old jockey Martin Garcia. 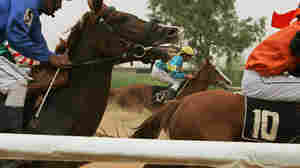 He rode the horse Lookin' at Lucky to victory at this year's Preakness Stakes. Host Liane Hansen profiles horseracing's new celebrity. May 29, 2010  Babe Ruth attended and learned to play baseball at St. Mary's Industrial School for Boys in Baltimore. That school, now called the Cardinal Gibbons School, is slated to be closed by the Baltimore Archdiocese at the end of the school year. Baseball fans and local residents fear an important baseball landmark will be lost. Host Scott Simon visits the school to learn about its history and efforts to save it. May 29, 2010  In the face of hardships that brought so much of Iraqi life to a crashing halt, members of the club have displayed an astonishing tenacity in clinging to the remains of their secular pleasures. Each Tuesday and Saturday, Iraqis converge on the club's racetrack to enjoy a day at the races -- and perhaps win a few dinars. May 28, 2010  A record four female drivers will compete in the Indianapolis 500 on Sunday. Melissa Block speaks with Janet Guthrie, the first woman to race in the Indy 500 and NASCAR, about women and racing. May 28, 2010  Cyclist Floyd Landis sent the sports world buzzing last week with his admission that he used performance-enhancing drugs and his accusations that other top-flight cyclists did the same. But while the attention is focus on WHO engaged in doping, investigators are focusing on Landis' description of HOW they did it. May 26, 2010  It will be a worldly U.S. squad at the World Cup in South Africa next month: 17 of the 23 players selected for the national team currently play for European professional teams, and two others play in Mexico. May 26, 2010  James Cassella, the mayor of East Rutherford, N.J., talks to Melissa Block about the Super Bowl coming to Meadowlands stadium in 2014. The stadium's actually in Cassella's city, but as usual, New York will probably get all the glory. May 26, 2010  Soccer is increasingly popular in the states, but for many Americans, the World Cup can be summed up in two words: learning curve. 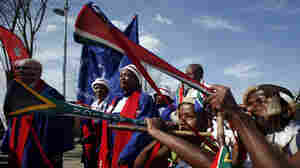 The 2010 FIFA World Cup kicks off in South Africa on June 11. Don't know whom to root for or which teams are playing? Sportswriter Stefan Fatsis provides the lowdown on the players and teams to watch. World Cup Warmup Match: Czech Republic Beats U.S.
May 26, 2010  Heading into next months World Cup in South Africa, the U.S. soccer team played a "friendly" match against the Czech Republic Tuesday night in Connecticut. The Czech Republic failed to qualify for the World Cup, but it was good enough to beat the U.S., 4-2. May 25, 2010  Cubs fans always swear a brighter day is on the horizon. This season, the man who embodies that hope doesn't swing a bat or wear a glove. Tom Ricketts and his siblings bought the Cubs last fall — becoming the first family to run the team in nearly 30 years. May 25, 2010  The Supreme Court ruled Monday that the exclusive merchandising deal that the NFL has with Reebok is an infringement of antitrust laws. The challenge to the deal was brought by a company that once produced NFL team caps and claims it was frozen out of the business by the Reebok deal. May 24, 2010  The Supreme Court ruled Monday that the exclusive merchandising deal that the NFL has with Reebok is an infringement of antitrust laws. The challenge to the deal was brought by a family-owned company that once produced NFL team caps but claimed that it was frozen out of the business by the exclusive deal with Reebok.